Okay, Purgatory maybe. I haven’t posted for a few months now, while jumping into some significant projects with my new consulting partners, James Shraiky et al, at the Interprofessional Studio for Complexity Thinking (InterSCT – www.intersct.com ). CHAMPS and Luke 101, all groups doing impressive work in the area, as well as in Kenya. More recently, in partnership with international health researcher and doctoral student, Danielle Wofford, we published a formal paper on Syrian refugees in Turkey, based on James’ investigations in the Spring of 2015 (http://jhhe.sempervifoundation.org/files/1814/6074/3776/JHHE_v2n1_Spring_2016_Spreads.pdf ). James’ Syrian upbringing and multi-lingual capabilities proved quite helpful. Our joint efforts have covered a lot of ground, ranging from schools to colleges, health care facilities, orphanages and nursing homes. Projects in the wings include a Health Sciences campus in Haiti and further research in Turkey. But what I wanted to ponder in today’s column are Schools in Hell. Or Purgatory. Haiti is the poorest country in the western hemisphere, center of a slave trade for centuries, the first nation of slaves to declare independence and the victim of a horrific earthquake a mere 5 years ago. A ride through the streets of Port au Prince is a rough, nausea-inducing ride (I speak from experience) through ruts and rubble, surrounded by barbed-wire topped fences, goats munching on trash and Haitians running the humblest of booths, just trying to survive. When we inquired, the vast majority limited their “hopes and dreams,” when asked, to finding a paying job. Any job. And at almost any level of pay. Three dollars an hour is about average for those who could find work, and most could not. A close second on their list of needs is education. They’re well aware that education provides their best chance of escaping from dire poverty for themselves and their children. When asked about violence in schools, students and staff alike looked at me like I’d lost my mind. “Why,” they ask, “would anyone shoot up a school?” It was incomprehensible. They considered access to even the most basic schooling as manna from Heaven. In the K-12 school we visited, many students walked out of the surrounding hills for up to an hour just to get to school, and managed to show up clean and neat, wearing uniforms, the girls’ hair intricately coiffed and ribboned. Schooling was hit and miss in camps. Some kids lacked enough clothes, food, sleep, medicine, literacy or language skills to prepare them to even attend school. In the vast majority of cases, no one had books, papers, pens or pencils, let alone laptops or internet access, to support their studies. Despite all of that, most did everything they could to make schooling happen. 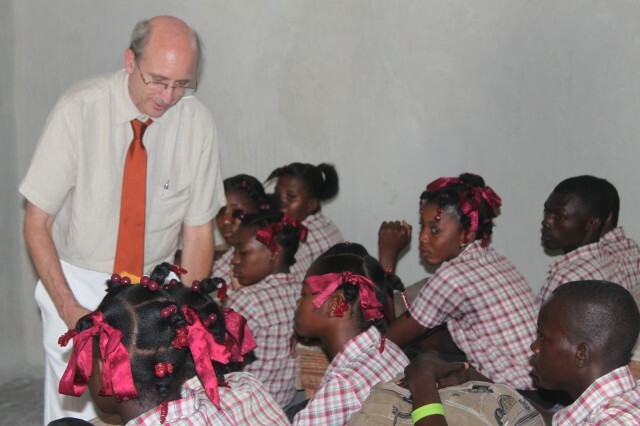 They valued education even more than the Haitians – not only as their best hope at securing a better future, but as a far superior alternative to hanging about in the mud, or in soggy, chilled tents, waiting helplessly for months or years just to find out whether they won the lottery and were officially recognized as legitimate refugees. Despair and PTSD were the common threads running through their lives – but this didn’t stop them from trying. Meanwhile, I continue to inspect schools in the U.S., and chat with the media about the most recent threats of violence, but I find it so hard to reconcile our wealth, and our violence, with third world poverty and appreciation for the most modest of opportunities by some of the most desperate human beings on the planet.